In March in 2010, OUTR was invited to participate in the Australian Davos Connection “cities summit” in Melbourne to address Australia’s exploding cities. The summit was being held at Victoria's first heritage-listed building to be refurbished to a 5 Star Green Star office design standard, the Goods Shed North, home to the State Government's sustainable urban development authority, VicUrban. The objective of the two day summit was to create a national blueprint for the long-term planning of sustainable, productive and liveable human settlements and cities. Topical issues of population, urbanisation, security risks, rising house prices, water shortages, social exclusion and climate change where also addressed. Michael Roux, Chairman of the Australian Davos Connection, says the Summit will highlight the huge potential for improvement in Australia’s urban centres. He adds “The purpose of this summit and Report is to give governments and policy makers the resources they need to make informed decisions when it comes to how we manage our capital cities in the future. We have the full support and encouragement of the former Prime Minister in this initiative. It is absolutely the time for action”. 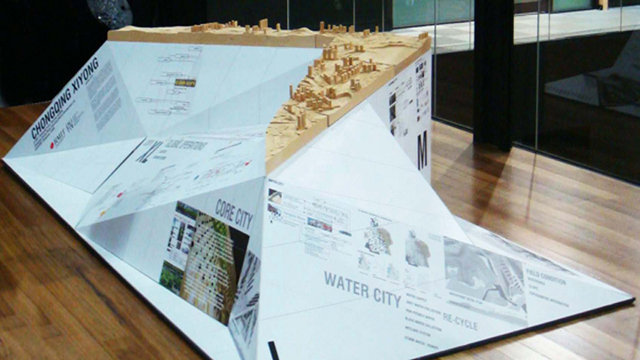 OUTR exhibited works from two of our radial Chinese urban models, Jiaoshan Islands at Lake Taihu and Chongqing ‘Core City’. Craig Douglas and Thomas Harper presented these two projects to the Prime Minister of Australia, John Howard and Chairman of the Australian Davos Connection, Michael Roux.